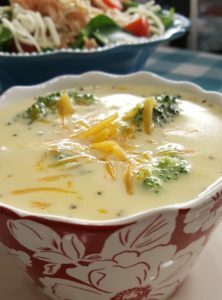 Place broccoli, carrots, chicken stock, and chicken base in an 8-quart heavy pot. Cook together over medium heat until boiling, and then simmer 2 to 3 minutes. Remove from heat. I a large skillet, melt butter until bubbly. Add flour all at once and begin stirring with flat slotted spatula until smooth. Slowly add the half-and-half, stirring constantly for a smooth consistency. Add the Velveeta and continue to stir until smooth and cheese is melted into the cream. 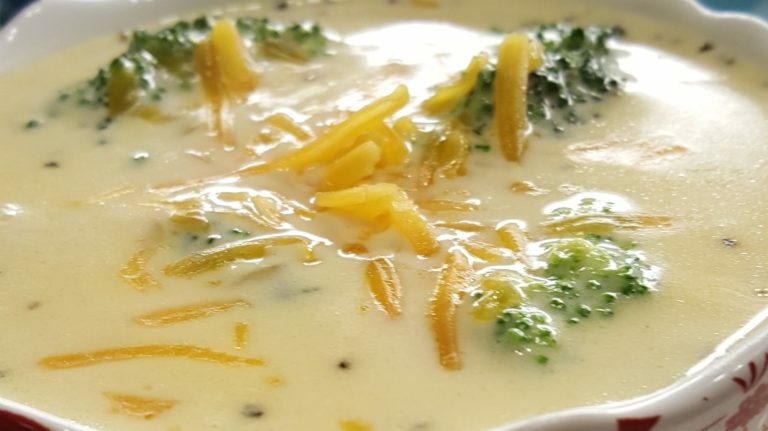 Add the cheese sauce to the broccoli mixture and simmer over low heat about 8 minutes, stirring often; be careful not to burn bottom. Add the salt and pepper to taste. The soup will continue to thicken as it cools. Garnish top with shredded cheddar cheese. Makes 4 bowls soup.